Home > Uncategorized > Children’s Motrin Oral Suspension Dye-Free Berry or Bubble Gum Flavored Only $3.97 From Amazon! 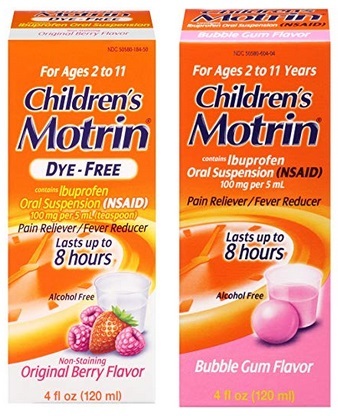 Children’s Motrin Oral Suspension Dye-Free Berry or Bubble Gum Flavored Only $3.97 From Amazon! February 11, 2019 Comments Off on Children’s Motrin Oral Suspension Dye-Free Berry or Bubble Gum Flavored Only $3.97 From Amazon! Amazon has the Children’s Motrin Oral Suspension Dye-Free Berry, Ibuprofen, Fever Reducer, 4 Oz for $5.97 plus clip the $2 coupon to bring the total to just $3.97! The Children’s Motrin Oral Suspension, Pain Relief, Ibuprofen, Bubble Gum Flavored, 4 Oz is also $5.97 plus clip the $2 coupon to bring the total to just $3.97 but this is an “Add-on Item” meaning you can only purchase this item with a purchase of $25 or more. 4moms mamaRoo Classic Only $140.79 (mamaRoo Soft Plush Fabric Only $159.99) + Free Shipping From Amazon! !